JUST RENOVATED-COMPLETED JUNE 2018 - Nantahala mountains, Large Running Creek, Hot Tub, Fireplace,New Log Home. Motorcycle Friendly Home, loves Harley Riders. U do not need a 4 wh drive to access this cabin. Roads are well maintained and easy access all the time. New log cabin, two stories with loft,wraparound covered porch, large fire place, and a game room with large tv and foosball & pool table. A creek with fish runs the length of property and the hot tub looks it. This is a favorite cabin for families and newlyweds. It is completely furnished, dishes, tv's, big screen, theme rooms, leather tv./game room with foosball & pool table. The favorite cabin of all. You are close to Cherokee and Cherokee Casino (30 minutes). You are 30 minutes from Maggie Valley and can ski in the winter and go tubing down the mountain.. You can take day trips to Pigeon Forge and Gatlinburg, Tennessee (approximately two hours). You can river raft on the Nantahala Gorge, hike, bike, and horseback ride. Waterfalls are wonderful. The cabin is like a mini heaven. One pet will be allowed with a non-refundable $100 deposit with prior approval. Come and have fun. my husband and I own Cherokee County Cycles in Andrews NC which is 15 miles from this cabin. We are a large, large, large, motorcycle store and this cabin is very motorcycle friendly. Stop in and see us and ask for a riding map. 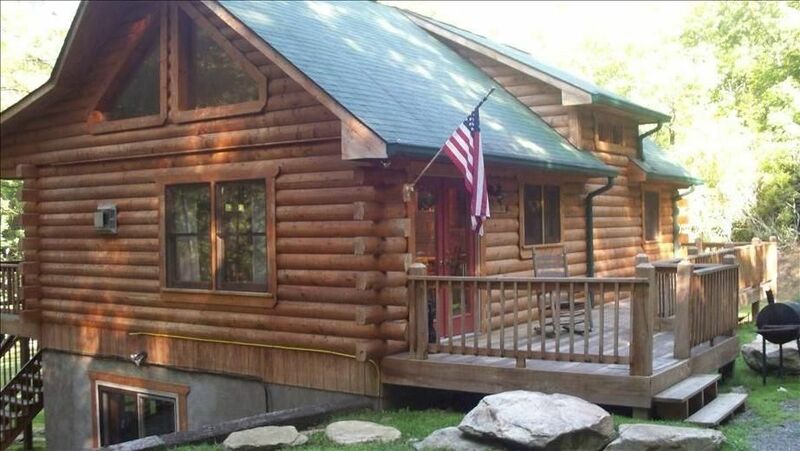 We chose this rental cabin because it is on a beautiful setting and motorcycle friendly. You can get in and out without any problems whatsoever and in the winter too. It is on the way to the Dragon, Tail of the Dragon, Deals Gap, Fontana Dam, Hwy 28 and Wayah Road, my favorite. Peace. Privacy, Beauty, Nature, Forest, Lake Santella, Lake Nantahala, 90 miles from Ashville, and 2 hours from Atlanta, Knoxville, Chattanoga, and the most beautiful motorcycle roads in the usa. Just a wonderful place to stay. My family had a wonderful 3 night stay. The cabin had everything we needed and more. The kids enjoyed the creek and exploring the grounds. I would recommend this property to anyone who asked! Peace and Tranquility, just what was needed! Even for a family of 7, the week was very peaceful. There was plenty of room for us to share but not get in everyone's way. Sitting on the porch listening to the stream below seemed to be the favorite activity at the cabin! When we got there, we each found our rooms and made ourselves at home. The kitchen was large enough for 3 people to cook and fix meals. There are several things in the kitchen in case you do forget some stuff (salt,pepper, etc.) and there are pots and pans for almost anything you want to cook. There's cleaning supplies under the sink, and in the bathrooms there are plenty of towels for everyone. Just remember to bring your own toilet paper, we found that out rather quickly! Robbinsville is few minutes' drive down 129 and the Ingles grocery store is right at the first light. We did have a rather strong storm pass by the second night and the power went out for about 16 hours. We didn't open the fridge and the food all stayed cold enough to not have to discard it. We spent most of the day out and the power was back on when we came back. We weren't able to enjoy the back yard at all, though. Since it slopes down to the stream the run-off water goes down the back of the cabin, so with all the rain, the backyard was sopping wet... but I'll bet that slope makes for great fun in the snow!! Everything worked well in the cabin, hot water, all the lights worked etc. I had to turn off all the lights in the cabin at one point because I wanted to do some night photography and the night sky from the cabin is just gorgeous. When there aren't any clouds and no moon you can see thousands of stars!! Just beautiful. I am looking forward to coming back in the fall, this place must look amazing during the fall! Good cabin choice. Beautiful setting. Cabin was what we expected. Loved the brook nearby. Needed more blankets for the beds—we were cold. Also expected paper products to be available. Otherwise, lovely experience. We took our grandchildren, 13 & 7, on our annual fall trip. Found this cabin and it had everything we wanted and reasonably priced. We had plenty of room for sleeping. Loved the game room, hot tub and they especially loved the creek! They loved exploring the little trails around the property and walking through the neighborhood. Everyone was so friendly. The cabin is so nice and so beautifully decorated. If you need anything you can give Jenny a call and she takes care of it. Thank you Jenny for opening your home for others to enjoy. Thank you for the kind and wonderful comments. It was our honor to have you and we are thrilled that you all had such a wonderful time. Hoping you come to stay again. Amazingly beautiful cabin! All the comforts of home! Well stocked. We loved playing pool in the game room, relaxing in the hot tub, and swinging on the porch overlooking the beautiful creek! We hiked the nearby Yellow creek falls which was beautiful!! We had a wonderful weekend getaway, and I can’t wait to return!!!! I highly recommend!!! Thank you so very much for the wonderful review. You are welcome to come back any time. Thank you again. Snow Sking, Gambeling, Train Rides, Large Antique Area, Lots of Activities for all year round, Remember you will be in the U, S, Everyone wants to be in this area and spend time in Nantahala, Motorcycle heaven over the Cherohala Skyway, It is your turn. To you motorcycleist, this one is one the way to the DRAGON off of Hwy 129.